Tsarskoe Selo palace is about 25 km. south of St. Petersburg and was built at approximately the same time and in a similar style to Peterhof. It is a wide but not deep building and here you can see the windows on the front and back at the same time. This is the main ballroom. After the revolution in 1917 this palace was also turned into a museum and was no longer anybody's home. This palace was also captured by the Nazi forces during the siege of St. Petersburg. 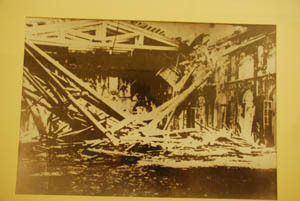 The bombing and fires destroyed it as well as Peterhof. Everything here is a reconstruction as well. On the left is a series of six doorways between the rooms today, on the right the series as it was in 1945. The white stuff is snow, there is no roof. This picture on the left is of the main ballroom, compare it to the first picture above. And in fact the reconstruction of the palace and grounds is ongoing today. 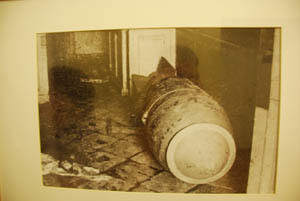 In the process they have found eleven of these aerial bombs that had not exploded. 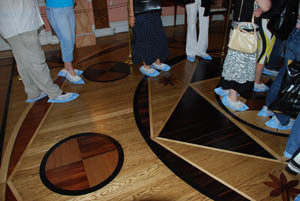 Like at Peterhof we have to wear booties to protect the wooden floors. They have done an amazing job on the reconstruction. 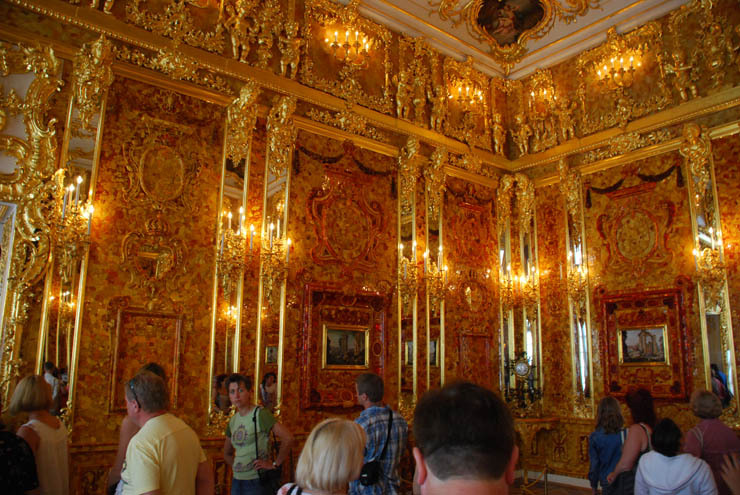 The most amazing room is "The Amber Room". Amber is petrified tree sap and is a variety of shades from pale yellow to a deep, dark orange. The room's walls are covered with pieces of amber. 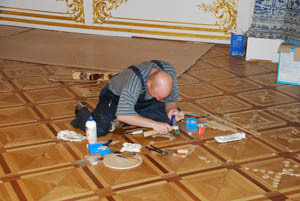 The Russians tried to remove the coverings with the rest of the furnishings when the Nazis came near but were unable to do so without destroying them. So they covered them with paper and left them. 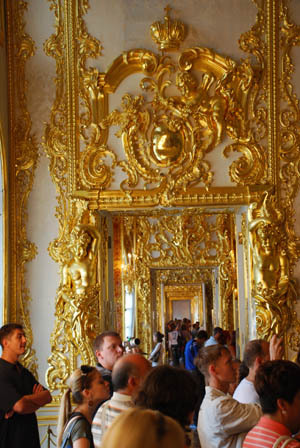 The amber in the "picture frames" has been carved into figures of people and animals and decorative shapes just like a real gilt frame from that era. Picture taking is not allowed in The Amber Room so I had to sneak these. Please don't tell the Russians that I took them before we get back across the border to Finland. The general opinion for many years was that the Nazis went ahead and peeled it off and took the Amber Room's wall coverings back to Germany before burning the building. Now a story is circulating that some Russian soldiers accidently burned the room and made up the story of the looting because of their fear of Stalin's anger if they told the truth. In any case it was gone and the Russians have been working on the reconstruction since 1979. It was completed in 2006, funded mainly with German money. There were many pictures to use as a guide for the reconstruction and the Baltic area is famous for its rich stock of amber. 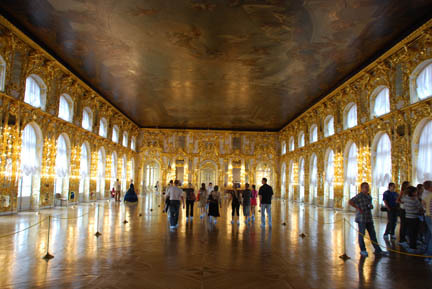 After the war the Russians searched the ruins for scraps of gilt, walls decorations, parquetry, fretwork, etc but of the Amber Room there was nothing left. 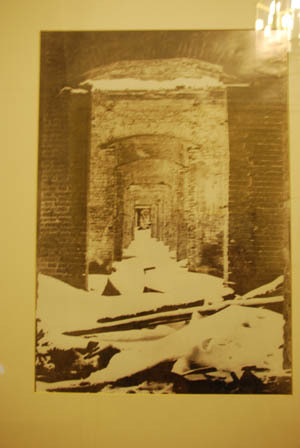 They did use what they found along with pre-war pictures to guide the rest of the reconstruction. And this is what we have today. 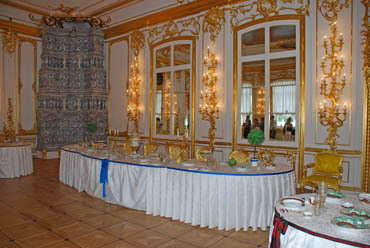 On the left is one of the dining rooms and on the right is the "Picture Room". The pictures are painted on the wall not hung on the wall. We also explored the park-like grounds and they were nice to walk in but nowhere as spectacular as Perterhof's where we were yesterday. 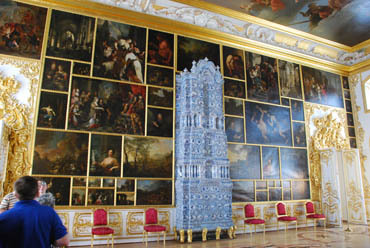 Next is the Hermitage, one of the biggest museums in the world.